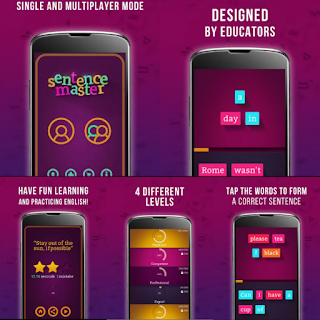 Sentence Master is the first game of its kind designed and developed completely by educators to help students eliminate the most common mistake among English language learners, correct word order. With four levels from beginner to expert, Sentence Master is a challenge for everyone from the Beginner to the most seasoned English language communicators. The Proverbs and Sayings level is a great way to learn and remember popular English idioms and expressions. Beginner: Ideal for children. This level contains the easiest sentences with the fewest words to unscramble. Skilled: This is where things start to get harder. This level is great for adults who are beginning their English language learning adventure. Professional: Great for users with a solid base in English who want to keep their skills up to date. Expert: Only for those with the most proficient English skills. Are you one of them? Proverbs and Sayings: Every language has its idioms and expressions. Learning the refrains of the language of Shakespeare has never been so fun. Do you have what it takes to become the next Sentence Master? Try your luck in single player mode or against friends and other players worldwide. Learn English with a smile on your face.